Scott Root helps educate youth about responsible BB gun use. I remember that I was a pretty good shot, but accidently shot holes in a couple of neighbors’ windows. My mother still scolds me 30+ years later and reminds me about the many BB holes they found in my walls and closet and the countless BBs that they found underneath the carpeting of my old bedroom when remodeling. I truly had a great time with that BB gun—until “it” happened. Many songbirds are illegally shot with BB guns each year. One spring afternoon, I was tired of the usual targets, and I made an amazing shot on a beautiful robin in our cherry tree. After my momentary elation, what I had just done dawned on me. I killed momma robin. I sat and stared at the nest a foot or two from where she was perched. I instantly felt terrible inside. I realized that I hadn’t killed just a bird; I had probably killed several babies as well. I think there is an “Andy Griffith Show” episode where Opie did the same thing. I never killed another bird with my BB gun after that event. I am an avid upland game bird hunter and an avid birder as well. I have taught thousands of youth about birds throughout my career as a DWR Conservation Outreach Manager. While teaching, I have often been asked by a teacher or scout leader what the youth could do to make a difference in helping wildlife. With this question in mind, I decided to do an informal survey over a one-year period. I asked over 1,000 kids in my presentations, “How many of you have BB guns?” Generally, about half of their hands went up. Then I’d ask the kids not to answer aloud or raise any hands, but to think about this question: “How many of you have killed songbirds with your BB gun?” In most cases, several kids boasted aloud about killing birds. It became apparent that many birds are illegally shot each year by BB guns. A lot of the kids don’t know it’s illegal to kill birds. I turned this issue into an opportunity for them to help wildlife. I explained to the youth that if they stopped illegally shooting wildlife with their BB guns or blowgun darts, they could make a real difference toward improving our bird populations. Then I told them that they could make an even bigger difference by talking with their friends who shoot birds. I challenged them to educate their peers about the impact of illegally killing birds. Animal control officers removed blowgun darts from ducks and geese in January. 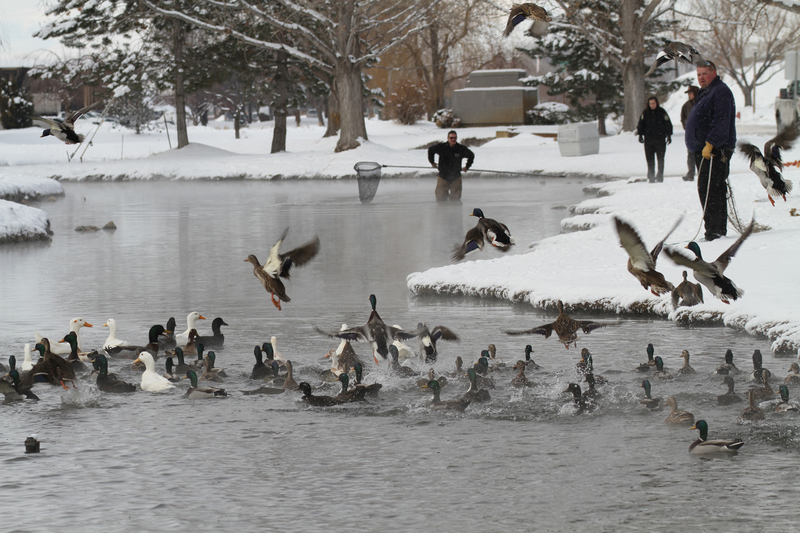 In mid-January, animal control officers had to trap and remove blowgun darts from several domestic ducks and geese in Springville, Utah. Blowguns are becoming quite popular and, unfortunately, a few people have chosen to shoot wildlife or domestic animals. City animal control officers receive several complaints each year regarding domestic ducks and geese being shot with blowgun darts. Many of these animals are found around urban ponds. Shooting wildlife with BBs or blowgun darts is illegal, and a person can be charged with Wanton destruction of wildlife. Shooting domestic animals falls under animal cruelty laws. First-time offenders that shoot wildlife or domestic animals can typically be charged with a class B misdemeanor and charged up to $299 per occurrence. Depending on the circumstances, second-time offenders can be charged with a felony, serve time in prison and receive larger fines. Education is one of the keys to putting a stop to these illegal activities. I usually close my public presentations by stating, “The more we learn about wildlife, the more we appreciate wildlife. The more we appreciate wildlife, the more we will want to take care of wildlife.” This message applies to domestic animals as well. To report any poaching of wildlife, call the DWR hotline at 1-800-662-DEER (3337). Contact your local city police with any information regarding animal cruelty toward domestic animals. This does not apply to nuisance birds such as European Starlings, House Sparrows, Domestic Pigeons, Mapgies, etc, correct? Clarifying that killing these birds may actually help songbird populations and provide beneficial opportunities for young hunters alike. Matthew, Black-billed Magpies are a native species that is protected under both federal and state law. I believe you are correct about European Starlings, House Sparrows, and Domestic Pigeons. I work in east bay in provo, ut we have noticed several DOMESTICATED duck’s with dart’s penatrating them.. found a dart in parking lot. you can step up the parole around the DITCH’S behind sam’s club & sportsman’s wharehouse … I personally havent seen these duck’s but a couple employee’s have told me, I have seen the dart.. we will keep our eye’s open also, feel free to call.. if i can guide you with any more info, cody 801-602-7973.. This is really great that you are doing this and bringing this type of education to kids. And not only for the songbirds, but also for the Raptors, Corvids and and other large birds often targeted and not just by BB Guns and nor just by kids. It sounds like a really great program and I hope it makes a difference. Great article as well. Though Black-billed Magpies, Cowbirds, House Sparrows, European Starlings and Domestic Pigeons can be killed, there are some strict regulations in place. Please see the rule (R657-3-7. Take of Nuisance Birds and Mammals.) for details. 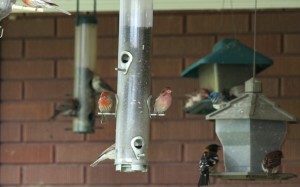 Hi, I agree with you on songbirds and city birds. But what about crows? Can they be legally hunted or not? I personally see them as pests. Numerous times I have seen they kill pheasant chicks/eggs and many other game bird species. I would like to know, to improve game bird numbers. Even though crows are only short-distance migrators, they are protected by the Migratory Bird Treaty Act of 1918. That being the case, they’re governed by federal law. The law allows for killing certain corvids, like magpies and crows, in certain depredation situation without obtaining a permit, but in general, intentionally killing crows is a violation of federal law. I am genuinely interested in taking Eurasian collard doves by air rifle with-in city limits. I would like to know if this is legal or no. What about baiting for them? I have also been looking over the State, County, and City laws for SLC and cannot tell if you can take Eurasian Collared Doves in the city with an air rifle. Anyone have a link that can clear this up? To John (of Aug. 9, 2013) No Crows cannot legally be hunted. What to you is a “pest” is to other bird lovers an amazingly intelligent and beautiful bird. And I suspect what you saw killing pheasant chicks/eggs was really a raven. Each incorporated municipality has their own rules, but many prohibit the discharge of firearms or anything like a firearm (blowgun, air rifle, crossbow, etc.). We do believe it is illegal to shoot air rifles in SLC. But you could always check! The best advice we could give would be to check with your local city officials for specific boundaries and limitations. As far as collared doves are concerned, they aren’t a legally protected species and can be taken whenever and however someone would like. What is a good way to discourage magpies from hanging out in my yard? They are quite destructive and “heckle” smaller birds that like to perch in my trees. So where could I find the right information to find out whats legal to shoot and what isnt? Hey I was wondering if it was legal to shoot swallows if they are a nuisance? John, yes you can shoot crows there is a new crow season for Utah. The magpie population in SLC is exploding, and they are very destructive of fruit trees, ornamental plants, garden decor. Can the city do anything about it? Are u allowed to shoot erasion collard doves with bb gun & blowguns because they are non-native bird and the DNR small game books say that u can take as unlimited amount of them and with out a liscents? It’s hilarious crows are protected by the federal government. They are the worst birds on the planet. I just shot a Robin (red bird) with my air rifle and I wanna know what I can do?……I shot him thinking it was a squirrel but I found out that he is a red bird. Do we even have squirrels in Utah? I know it’s a silly question but I rarely see them. I used to live in Houston TX where they roamed rampant down the streets! It only occurred to me recently that kids who are from families that hunt would shoot birds. I can’t imagine the number of birds killed this way every year. And I’m startled to read on this thread, which birds are okay and not okay to shoot. I realize that some animals are a nuisance, and I understand hunting for food, if it’s necessary, but for the life of me I can’t imagine any child enjoying killing any animal for pleasure. There is just something nasty about that. We’re taught that children who enjoy killing small animals are potentially budding psychopaths, yet much of our culture teaches them that killing for the enjoyment of killing is fine. I hope some day we can learn to be pro-life about ALL life. I live in West Valley City. Is it legal to target shooting with an air rifle in my enclosed (fenced) backyard? Thank you!! Please read my latest comnent regarding Mallards. All my family was present when this incident occurred. We were livid when we saw our birds being shot at. Much less the thought of any animal being shot at for pure enjoyment. And, we come from a line of strong bow hunters. Big game. Need Only. NOT ALL hunters think the same. THANKS MUCH FOR THIS BLOG. ADVOCATES FOR SELF RELIANCE=HUNT FOR NEED ONLY. can I get a list of legal birds to shoot with my air rifle. I started a large garden this year. To my surprise a family of magpies has moved in, 7 of them. Thus far they have only chased the cat and the neighbors dog, for some reason they leave my English mastiff alone. I don’t know if they are the reason but my vole problem is over. (Those are destructive to gardens.) Either they ate them or scared them off. The birds don’t seem to be doing any damage to the plants and are eating a lot of insects. I have run chickens to control insects in the past but can’t where I live now. The birds are noisy and chase everything else off, but thus far the benefits outweigh the noise and they are really fun to watch. If they are not chasing other wildlife or the cat they are constantly playing practical jokes on each other. Setting up a bird bath for them as the sprinklers won’t be coming on as often now that everything has sprouted. They do love to bath in the bush sprayers over the pumpkin patch. There’s a hawk that’s been coming into our backyard. We raise chickens in our house and they have chicks, this hawk has killed and ate over 10 of our chicks and now it’s been coming back to our backyard for more. Yesterday it came and injured my chick that’s about 1 month old. My chicks and chickens are terrified. I keep them in a coop and sometimes let them out so they can eat grass. This hawk has been making me restless, having to look out for it. It came in my backyard and sat on the roof of the chicken’s coop. I’m scared for my chicks. Can I shoot it with a bb gun if it comes in my backyard?